Cheoy Lee started building boats in 1870, and now 148 years later, the yard is still owned by the same family. Yachts are only a small part of the Cheoy Lee business, as they build many commercial vessels and this commercial heritage is obvious in the engine rooms of all yachts built by them. 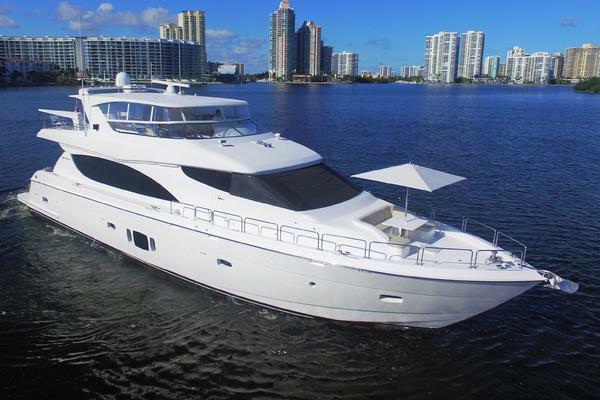 This motor yacht has four staterooms plus two crew cabins. It is powered by the desirable Caterpillar 3412 engines that were rebuilt in 2014 by a Caterpillar dealer and have less than 500 hours since. The master has a separate stairway entrance from the main salon. The Main Salon is accessible from the Aft Deck through a stainless steel framed glass sliding door. There is also Ultra suede headliner throughout and Hunter Douglas Duette shades. Upon entry one cannot help but notice the open airy feel as a result of the 21 foot beam and the 6'10 headroom. All the couch cushions have been recently re-upholstered. Each couch has its own cocktail table. The tables are custom made with mahogany edge and lacewood veneers. 25 disc changer. The system has a 6 channel speaker selection with Boston Acoustics Speakers. In addition there is DSS satellite TV with 3 decoders and a KVH Tracvision II antenna as well as a datatronics antenna. There is a wonderful view in the main salon either standing or sitting due to the large windows throughout the entire area. 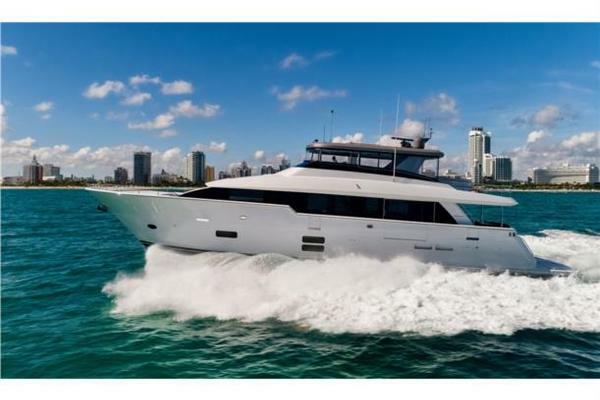 Between the stairwells on the starboard side is a bar with sink, storage area for full wet bar, and Sub-Zero refrigerator. On the port side is a large formal dining area with custom table seats 10 comfortably, and above the dining table is a custom soffit with lights. A mirrored glass enclosed china display cabinet and buffet top with storage cupboard below completes the dining area. The cabinets are custom fitted for a full set of Fine China and Crystal, keeping them safe in any sea conditions. The chairs around the dining table are brand new custom designed chairs with matching upholstery. Forward on the starboard side is a spiral staircase leading up to the Flybridge or below to the Guest Staterooms. Forward of the staircases is an on-deck powder room (dayhead). Elegantly designed in gold with mirrored ceilings, marble countertop, wallpapered walls and marble floors.